Crush the vanilla wafers, animal crackers and nuts in a blender to a fine consistency. Mix these together with the melted butter in a bowl then press tightly into an even layer in the pie pan or baking dish. Bake at 350 degrees Fahrenheit for 15 minutes or until golden brown at the edges. Allow to cool. Prepare the pudding mix per the package instructions and place in the refrigerator to set. Once your pudding is set and your "crust" has cooled, grab out your martini glasses and slice in 1/2 of the banana into the bottom of the glass, then layer in some of the pudding, then crumble in some of the cookie crust, then repeat. Save a few banana slices for the top. Add your whipped cream, sprinkle on a bit more of the crushed cookie crust for garnish and top off with the remaining few slices of bananas. 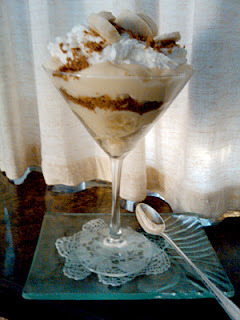 Makes 2 generous Banana Cheesecake Pudding Martinis! Try this as a Tropical Pudding Martini by substituting 1 cup of the milk with 1/2 a cup of coconut milk and 1/2 a cup of pineapple juice and add some toasted coconut to the cookie layers! There's a ton of different combinations you can use; think Black Forest with chocolate pudding and cherry pie filling or Chocolate lemon with lemon pie filling and chocolate cake - the possibilities are endless!